Feb. 7 at 12:41 p.m. The U.S. Justice Department plans to take the lead in lawsuits accusing Abbott Laboratories of illegally promoting anti-seizure drug Depakote for uses not approved by regulators, including dementia. Jan. 20 at 7:49 a.m.
Dec. 15, 2010 at 1:12 p.m. The Obama administration sued BP Plc and four other companies over the Gulf of Mexico oil spill Wednesday, charging violations of U.S. environmental laws, in the opening salvo in what will likely be a lengthy legal battle. Dec. 7, 2010 at 12:33 p.m.
Abbott Laboratories and two other drugmakers will pay $421 million to settle allegations that they falsely inflated product prices to gain larger government reimbursement payments, the U.S. Justice Department said Tuesday. 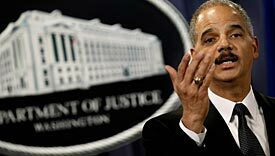 Dec. 6, 2010 at 2:26 p.m.
U.S. officials said Monday they have charged more than 500 people in what they dubbed the largest-ever nationwide sweep of scam artists preying on individual investors. Nov. 22, 2010 at 4:04 p.m.
Sen. Al Franken, a critic of Comcast Corp.’s proposed deal for control of NBC Universal, asked the Justice Department Monday to investigate whether the giant cable company had engaged in “illegal collaboration” concerning its intended target. Nov. 9, 2010 at 1:42 p.m.
A former lawyer for pharmaceutical giant GlaxoSmithKline Plc has been indicted on charges of lying and obstructing an investigation into the company’s promotion of an anti-depressant drug, the U.S. Justice Department said Tuesday. Nov. 3, 2010 at 3:56 p.m. The U.S. government has sued a Chicago lawyer, who was a partner at Seyfarth Shaw, to stop him from peddling allegedly sham tax shelters involving Brazilian consumer debt. Oct. 4, 2010 at 5:28 p.m.